Is Increased Employee Productivity Possible? httProductivity is a hot topic for most employers, as unproductive employees cost companies lost revenue in terms of employee time and amount of work completed. Tracking productivity can prove to be difficult at times, especially when companies are new to the scene or contain a large number of employees across several departments. But one employee’s productivity can affect the productivity of every team member, so it’s essential that leaders take the time to assess productivity and implement strategies to improve productivity among employees. At TIGERS(R) Success Series, we advocate for keeping track of productivity both through cost savings and productivity improvements. This is especially true when training and team development is involved because these two computations help you track your return on investment and determine if training transference has improved skills and attitudes. The following four team building tips can increase productivity among your employees. Productivity in the workplace starts at the hiring stage. All people are driven by different motivating factors, and a position that’s a perfect fit for one person may be a nightmare for someone else. To get the most out of your employees, you need to put the right people in the right positions based on strengths and not just resume experience. Finding the right fit typically comes down to three areas that you can assess during the hiring stage: passion, skill and economic drives. What people are passionate about says a lot about who they are as a person, and the best way to get them excited about their position is to give them an opportunity to pursue their passions and strengths. By giving them a chance to work on projects that get them excited, you’ll experience lower turnover rates and less call outs. Employees’ skill sets are also important to consider upon hiring. Some things can be learned, but someone who struggles with basic math probably won’t make an excellent accountant. Compensation is the third important factor to consider, as everyone has their own limits on how hard they are willing to work for how much they make. Offer a fair salary for the position, and you’ll have better satisfied employees who are more productive in their positions. We live in a fast-paced world, and most people are constantly engaged and doing something, such as checking emails, playing on apps or browsing Facebook. But this constant engagement stifles creativity and can seriously harm productivity. While you likely don’t want your employees to sit and do nothing while they’re at work, some down time away from distractions like phones and computers can prove to be extremely beneficial. According to one study by researchers from the University of Central Lancashire, participants who engaged in the mundane task of copying phone numbers from the phone book prior to being asked to come up with creative uses for a set of cups were more creative than those who didn’t engage in the mundane task. To manufacture boredom in the workplace, leaders can institute no-phone policies and assign routine but short tasks to employees, such as making copies or entering data, for about 15 minutes before they are asked to perform other tasks. By giving them time for their minds to wander, employees will return to their work better prepared with a creative mindset. Employees who feel recognized and appreciated for their contributions are better satisfied and more productive in their positions. While pay raises and bonuses are one way to offer recognition, they may not always be practical. There are other ways that you can offer recognition. Offering public praise, saying “thank you” and offering flexible scheduling are all ways that you can show appreciation without spending any money. Public praise, such as recognition during a weekly meeting or an employee of the month program, give top employees a boost in their self-confidence, and even a simple “thank you” in private can go a long way for an employee’s sense of accomplishment. Practical rewards, like the ability to come in later or work from home also show employees that you appreciate their hard work and trust them to continue that work, even with a little flexibility. When employees feel appreciated, they will be more productive. Adjust your strategy for meetings. Meetings are important, but they can prove to be real time and productivity killers when they aren’t implemented properly. Unorganized meetings without an agenda, reserved meeting space or specific time frame can eat up big chunks of time and destroy the productivity for multiple employees for the rest of the day. So to keep your meetings professional and relevant, ensure that you have a reserved meeting space, send out an agenda to all participants prior to the meeting and keep meetings on point and on time. Employee productivity is an extremely important and potentially costly aspect of business that leaders need to assess and improve, if warranted. Many helpful team building tips exist, but some easy strategies that leaders can implement include: hiring the perfect fit, encouraging boredom, offering recognition and adjusting strategies for meetings. With these strategies, leaders can increase employee productivity in the workplace. 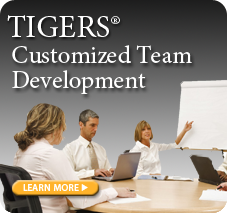 About TIGERS® Success Series, Inc.
TIGERS® Success Series is a Bend, Oregon Team and Work Culture Development Consultant offering a robust, comprehensive, behavior-based group development system that can help you track your ROI for change and workforce development initiatives. We train your team to expertly build and grow your business through teams for improved revenue, purpose and impact. Call US 1-877-538-2822 or International 1+ 541-385-7465 for more information.